The Department of Research Programming received a donation of part of the materials owned by Mr. Sato Tamotsu, a Japanese-style painter, who died in 2004, from his wife Ms. Kiyoko. 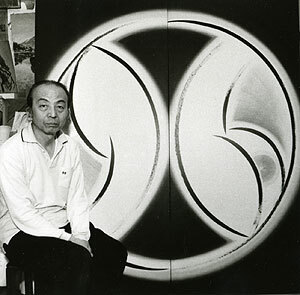 He broke new ground in postwar Japanese-style painting with his series of Mizubasho (Skunk cabbage) Mandala paintings that abstractly express skunk cabbages using bold circular arcs with sumi (Indian ink) lines. The donated materials include art journals and catalogs of the art group Chikyukai he set up with his colleagues in 1957 and various art groups. They have been delivered to the Institute, and we will organize the precious materials of postwar Japanese art so that they can be browsed and utilized. 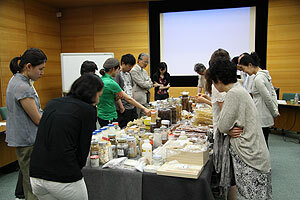 The Technical Standard Section of the Center for Conservation Science and Restoration Techniques held a seminar with the title Glue – (I) at a meeting room of the Institute on June 21 (Monday). There are many kinds of glue materials, and glues are traditional adhesives that have been widely used throughout the ages all over the world including Japan. At present the production of traditional Japanese glue (nikawa) is rare and there are many unclear points regarding its current status, including its physical properties. Against this background, Ms. Hayakawa Noriko, a researcher of the Center, outlined the physical properties of glues as restoration materials. This was followed by a speech given by Ms. Yamamoto Noriko of the Association for Conservation of National Treasures on the subject how to use glues for restoration and conservation from her viewpoint as a restoration engineer. Mr. Seki Izuru, professor of the Tokyo National University of Fine Arts and Music, gave a lecture on the achievements of studies on materials from his standpoint as a painter. 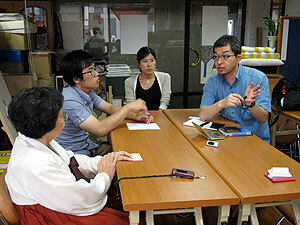 Finally, Mr. Morita Tsuneyuki, the professor of the Aichi Prefectural University of Fine Arts and Music, who once interviewed on the production of glues when he was a professor at the National Museum Ethnology, Osaka, gave an explanation on the glue production processes with documents. 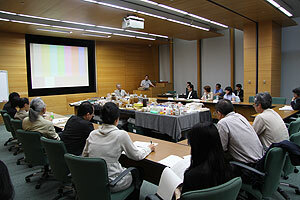 The lecturers’ speeches were persuasive because they were on subjects that the lecturers had studied throughout their long carriers; we also had an opportunity to observe many types of glue brought to the meeting room by Professor Seki Izuru, making the seminar a great success. On June 21, we held the training course shown above, intended to transfer the latest knowledge and findings related to the conservation environment to trainees who have completed the seminar course for curators engaged in conservation. 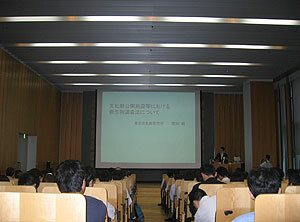 First, Mr. Yoshida, a senior researcher of the Institute, introduced the latest technological trends regarding white LEDs, which have recently seen a rapid increase in their popularity, from the viewpoint of preventing global warming. Then, Ms. Nishida Hiroko, the Deputy Director of the Nezu Museum, gave a lecture during which she brought some LEDs into the exhibition room, taking advantage of the construction of the museum. 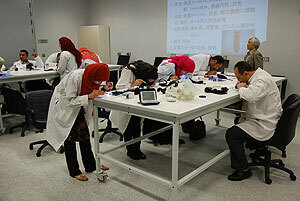 Following the lecture, Mr. Mabuchi Hajime, a visiting researcher of the Center, gave a lecture on the method of conducting microbial surveys in cultural facilities, which is his subject of research, and Ms. Sano, the head of the conservation science section, explained how to examine organic acid emitted from wood. Because the lectures for this training session covered topics that many cultural facilities have deep concerns about, approximately 100 people participated, more than in past years. At annual follow-up training sessions we will meet the needs of curators and provide them with the latest important information. 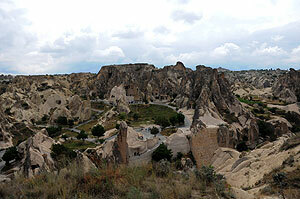 In the framework of the Cooperative Project for the Conservation and Restoration of Cultural Heritage in West Asia, from June 19 to 29, the Japan Center for International Cooperation in Conservation conducted a basic survey on the mural paintings of cave churches scattered around Cappadocia, Turkey, for which international conservation and restoration support is planned. 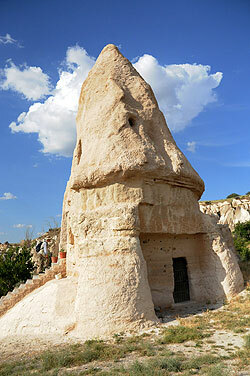 We investigated the conservation status of approximately 20 sites, such as cave churches with mural paintings done from the 9th to the 13th centuries, around the Goreme National Park, Cavusin, Zelve Valley, and Ortahisar area. Together with the local conservation specialists and the international conservation experts invited by UNESCO, we investigated not only the mural paintings but also the rocks and geological conditions of the caves where they were painted, discussed the future monitoring methods, and gave some advice on future conservation and restoration. The Japan Center for International Cooperation in Conservation conducted the eighth mission for Conservation and Restoration of Mural Painting Fragments in the collection of the National Museum of Antiquities of Tajikistan. This was part of an exchange program commissioned by the Agency for Cultural Affairs, from May 16 to June 22. The mural paintings were originally stable since they were on the walls of a building. Exhibiting them in a museum requires support in place of the wall surfaces. In the 8th mission, we decreased the weight of the support and also tried not to place any burden on the mural painting fragments when mounting them. The Tajik trainees mounted two mural painting fragments, excavated from the Buddhist temple ruins of the Kofir kara site, on the supports, following the instructions of Japanese restoration specialists, and exhibited them in a museum. 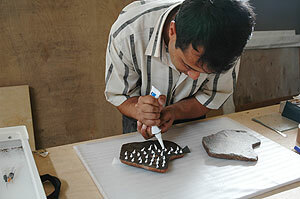 The Tajik trainees actively tackled the task of forming new supports and mounting the mural painting fragments. 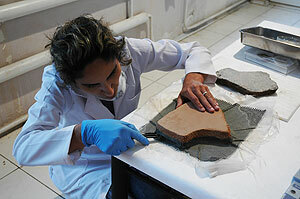 In the 9th mission, we will mount the mural painting fragments excavated from the Kara-i Kahkaha I site. During the period of this next mission, we will also hold a workshop on mounting mural painting fragments.